A classic Meritage blend of Cabernet Franc 40%, Malbec 35%, Cabernet Sauvignon 20%, and Petit Verdot 5%, this wine hails from one of BC’s coolest biodynamic vineyards. 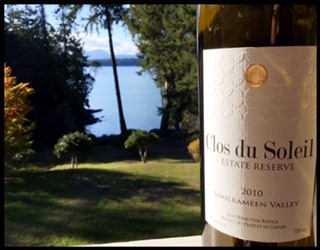 Clos du Soleil is located in a unique microclimate of a region – think rocks and glacial action, buttressed by soaring desert-like summer temperatures and snowbound winters. On the eyes, it’s deep ruby with aromas of blackberry, bright cherry, mint leaf and clove. The palate is dry with strained tannins and flavours of raspberry with more blackberry, dried leaf and some light leather glove. WSET Very Good, this is a super clean and delicious wine. If you are one of those people who keeps driving straight through the Similkameen Valley to Oliver and Osoyoos, you need to stop doing that. Make the effort, stop, get out of the car, and visit them at Clos du Soleil. This entry was posted in British Columbia, Cabernet Franc, cabernet sauvignon, Cabernet Sauvignon / Blends, Malbec, OTHER, Petit Verdot, RED and tagged 2010, BC, biodynamic, Canadian wine, Clos du Soleil, Estate Reserve, meritage, red wine, Similkameen Valley VQA. Bookmark the permalink. 2 Responses to Meritage, Clos du Soleil, Estate Reserve, Similkameen Valley VQA, BC, Canada, 2010, 14% abv. We loved the SSI background! Yes, we actually drank that a while ago!